Despite the rising interest in school districts, there are relatively few comprehensive resources available for graduate students in educational leadership programs. 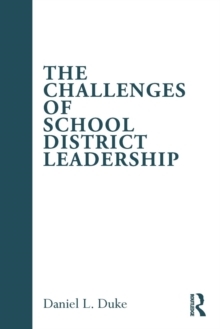 The Challenges of School District Leadership takes the position that the best way to prepare the next generation of school district leaders is to make certain that they are prepared to address the unending challenges that characterize public education today. Drawing on the latest research as well as actual examples, the book spotlights ten of the perennial challenges facing superintendents and school boards. Among the challenges discussed in detail are balancing equity and excellence, accommodating demographic change, coping with the increasing politicization of district leadership, deciding how to organize (or reorganize) a school system, and meeting the demands of educational accountability. This text is appropriate for graduate students in educational leadership, education policy, and the politics of education as well as school district leaders.